Background: Cancer is one of the most serious illnesses of our civilization. Therefore, scientists of different disciplines try to find new treatment strategies and new chemical molecules which might be useful in a cancer treatment. Objective: The goal of this work is to perform the most significant achievements in the area of chemotherapeutic treatment, published during the last two years. 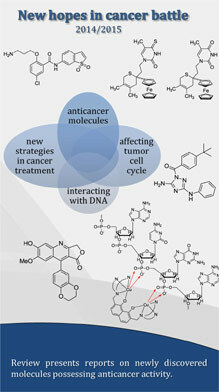 Methods: We reviewed almost 80 contributions, searching for new molecules with anticancer activity and treatment strategies. Results: We have presented tens of new anticancer molecules interacting with DNA or affecting cell cycle and new findings in this area. These compounds are chemically synthesized as well as are isolated from natural sources. The discovered molecules may induce cancer cells apoptosis, improve other cancer treatments, such as radiotherapy or reduce side effects of chemotherapy. Conclusion: The review shows that the cancer battle is still in progress and the combined studies in different disciplines, devoted to this subject, are a rapidly expanding area. Anticancer molecules, cancer treatment, drugs, drug delivery, drug development, tumor, mechanisms of action. Institute of Chemistry, Environmental Protection and Biotechnology, The Faculty of Mathematics and Natural Sciences, Jan Dlugosz University in Czestochowa, 42-201, Czestochowa, Poland., Department of Heteroorganic Chemistry, Centre of Molecular and Macromolecular Studies, Polish Academy of Sciences, Box: 90-363, Lódz, Poland.